The United Methodist Church’s Abundant Health Initiative promotes physical, emotional and spiritual well-being for all. Global Ministries’ Global Health Unit aims to create abundant health in economically vulnerable communities, in this case, by protecting mothers and their small children. Mothers breastfeed their newborns within an hour of their delivery. In the Democratic Republic of Congo, mothers giving birth at Abundant Health facilities are all taught and helped by staff and community health workers to breastfeed within an hour of giving birth. This is the nutrition and protection every baby needs. For best health and growth, Infants are exclusively breastfed for their first six months. Exclusive breastfeeding is hard work, especially for mothers who farm their land, manage a small business or work in a factory. In Nigeria, at Gwandum and Worom health centers, women are actively encouraged to give only breast milk for the first six months. Breastfeeding protects infants from childhood diseases. 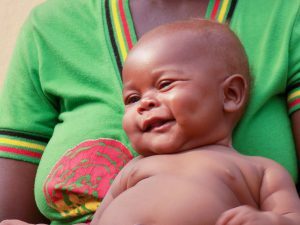 In Mozambique, pregnant women and new mothers are taught at Cambine Health Center and in the community that their breast milk has everything for their children’s healthy development, including protection from common, life-threatening infections, like pneumonia and diarrhea. Breast milk is available, safe and affordable. In Liberia, where the Abundant Health facilities and their catchment villages lack good roads or markets, mothers know that their breast milk is available, prepared and safe. 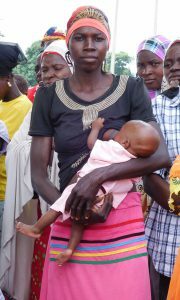 In all Abundant Health projects around the world, women are encouraged to breastfeed for their own well-being. It helps the family economy, it’s a contraceptive, and it reduces the risk of postpartum hemorrhage and depression, type II diabetes, and breast and ovarian cancer.